Went into Waterstone's today as my book tokens were burning a hole in my pocket. 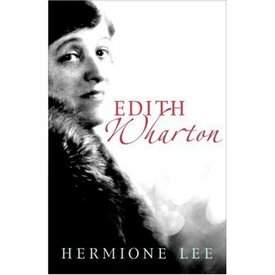 I have held onto them since 25 December 2006 which must be an all time record for me and the book I was saving them for, and which I bought today, is the new biography of Edith Wharton by Hermione Lee. The book is wonderfully produced, lovely smooth to the touch paper and lots of fascinating photographs, many of which I have not seen before. So, bang goes February, bang goes Elaine's Personal Challenge and the Winter Classics Challenge (thought I may slip a George Eliot into my handbag) as this book is of door step size and weight and at 700+ pages cannot be taken on the daily commute. I, therefore, see every moment I have in the evenings and weekends taken up until it is read. I was surprised to see it on sale as I thought it was not due until February, but I am not complaining. This was the last copy of what had obviously been a very large pile and as I picked it up (well, I didn't pick it up more like swooped on it whooping with delight) another woman's hand was an inch away. My dears, if looks could have killed I would not be here now, but all is fair in love, war and books. I am sure you will all agree with me.